If you aren’t a Chartbeat Publishing client yet, let us know what questions you have and how we can help. And for those of you using Heads Up Display, if you have any ideas, requests, or questions, please feel free to chat with our Chartcorps during a free online workshop, or email me directly at mona@chartbeat.com. Looking forward to hearing what you think! Built by the newest member of our front-end team, Nick “Nitro” Moy, Engaged Time makes its Chartbeat Publishing debut today! Why is this a big deal, you ask? I guess we should start with our thought process around how the publishing audience specifically consumes news content, which led to our focus on engagement as a metric. I’m not sure anyone would argue, at this point, that we can’t be judging our content solely by traffic numbers anymore. Traffic can be incredibly misleading when viewed in a vacuum. Volume is obviously fantastic – you need to know people are showing up, after all – but how do you know they’re actually reading and consuming your content? You need to know that you are keeping your readers attention, making sure they’re scrolling and reading down the page to the meat of your content vs. just knowing that you’re an ace headline writer that gets people to the page for a second before they bail entirely. That scenario happens all the time these days, right? Everything is shareable, we click on pretty much any link in front of us. So your job is not to just create and promote stories that intrigue, but you must must must engage. Otherwise they don’t remember (or care) that they’ve been to your site at all. If you’ve been with us for a bit, you know we’ve shown you engagement metrics in the past. 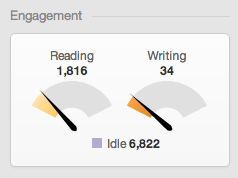 We’ve shown you a dial that shares the readers that are reading, writing, and idle. Well, this launch represents a new way of thinking for us and all you big-shot publishers. It shifts engagement from being only a state-based measure (reading and writing) to a measurement of time. Why the change? Well, what can you do with knowing 34 people are writing on this page right now? Is that good? Is that better than it normally is? Should you get in there and start commenting on it? You have no idea. So, we watched how journalists and editors talked about, thought about, and used the idea and elements of engagement and realized that you guys need something that’s a bit more quantifiable, something you can measure yourself against, instantly understand the context behind it and – most importantly – know how you should act on it. That’s why we landed on Engaged Time. Engaged Time on the Overview shows the aggregate total Engaged Time on a site in a heads-up way like “1 year, 2 months” of attention on the site, so Chartbeat members can compare against the same day over the past month. On a content level, we display the average Engaged Time on that article – so if Peter, Paul, and Mary are all reading this page and Peter spends 1 minute, Paul spends 30 seconds, and Mary spends 45 seconds it means this page has an average Engaged Time of 45 seconds. You publishers have a very different primary goal than the Chartbeat product’s audience. We learned by talking to and user testing with lots and lots of our Chartbeat Publishing clients that that main goal is to understand not just how the top pages are performing in both traffic and engagement, but also to find the highly engaging pages further down in the stack – maybe revealing it in your 30 or 40th traffic-ranked article. You need a way to highlight and work with those diamonds in the rough. We’ve added a new Engagement Module on the main dashboard view, so you can quickly understand your site’s performance today. In addition to the overall Average Engaged Minutes, we also show you how your stories are distributed by engagement. Total Engaged Time gives you a sense of aggregated growth over the course of the day, and of course, we still have our reading and writing metric represented as a percentage of engaged. Click on the “Engaged” label at the bottom, and all your stories will sort by the highest Average Engaged Time to the lowest. Like everything else in Chartbeat Publishing, your Engaged Time metrics pivot when you switch your dashboard to a Section or Author view, and a Page view. In fact, that’s where things get super interesting. Click on a page and see how many Engaged Minutes it racked up over the course of the day, and figure out where it stands in terms of Engagement against the other stories (through the distribution graph). This pivot-screen shows you that you can now sort by engagement and view your site through this new lens, one that goes beyond traffic. That bar graph shows you the relationship between engaged members (those actively reading, writing, scrolling) on your site. 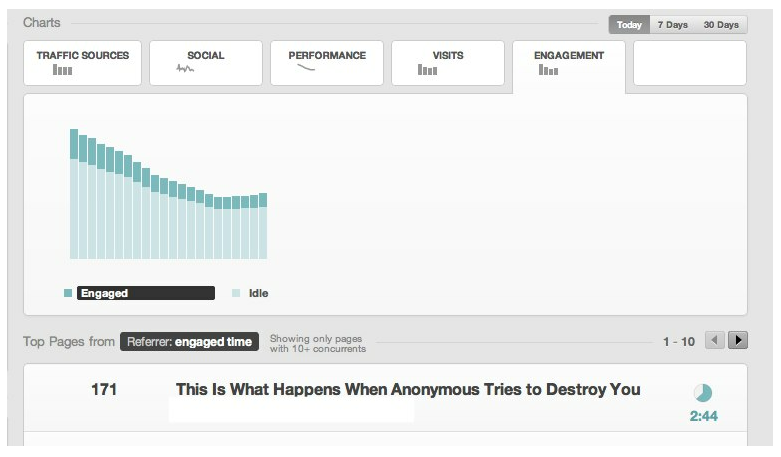 The little time circle on the page shows you the average Engaged Time on that page. Just an FYI – we created a minimum traffic threshold on the sort, based on your highest trafficked page, so you will see relevant content at the top (not just the random page that one guy in Detroit finds so interesting he’s been on it, actively reading and analyzing for two hours so that it skews your results). Find out why this story is SO engaging. What can you learn from it and potentially spread to less engaging stories? Decide whether to promote it further. Conceivably, this is what is keeping people on the page longer, so it’s your opportunity to drive them to a second story. Engaged Time tells you how much people love you. Make sure they stay in love. How is this Engagement Metric Different from the Rest? Ugh. Really? Another engagement metric? None of them work. I can’t do anything with them. Yeah, we hear you. We agree. Which is why we spent months and months and months and months building Engaged Time to be THE metric. We’re that sure about this metric because it’s built around what makes Chartbeat fundamentally different: Our technology. Most analytics sites (traditional and real time) measure the stuff happening on your site by the event: the page load, the click. So, if you’ve visited Page A then Page B, the time in between those two page loads is your Time on Page. But…what happens in between those two page loads? Are people actually reading? Is their tab just open in the background while they answer emails? What if they never make it to the next page? If this last bit is the case, how do you know if you have just inflated traffic numbers on an interesting headline that people aren’t actually scrolling or reading? We’re built with a totally different state-based system. We see what your readers are doing in between the clicks. We can tell if they’re actually engaged if they’re reading (scrolling, page up and down) and/or writing (keystrokes). If they aren’t engaged in either action for 30 seconds, then we consider them idle, and they’re not counted towards Engaged Time. Great. This is cool. But…what do I do with this metric? Keep an eye on the engagement number for stories that receive spike alerts. Highly trafficked stories are already exhibiting unusual behavior, so you want to try and increase Engaged Time on them as well to keep this audience as focused as possible. Add related links and drive an already engaged audience to more and more engaging content. Use Engaged Time as your decision-maker: If you’re trying to decide between two stories to promote through social channels or on your homepage the most engaging story should win. But we also want you to tell us. You know how we work — we watch how you work. 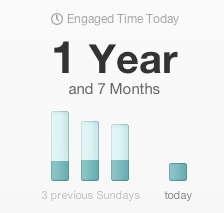 So keep us posted on how Engaged Time is working (or not) for you. Leave us notes in the comments for everyone to see or shoot us an email at chartcorps@chartbeat.com.